Bldg./Units are the individual free-standing structures at each of your Locations. You would use Bldg./Units if your organization has multiple campuses with multiple structures at each one. 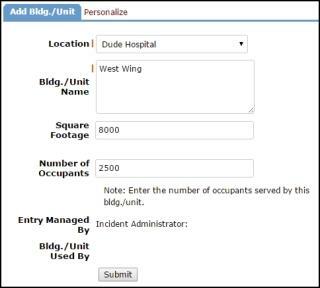 In order to add Bldg./Units into your account, you will need to set up Locations first. Enter the Square Footage and Number of Occupants for this building. This information is not required and can be added at any time.